Is your content a big hot mess? Is finding and retrieving the right information, when and where you need it, a challenge? Do your customers feel the same way? If so, don't fret. You're not alone. There's help available. 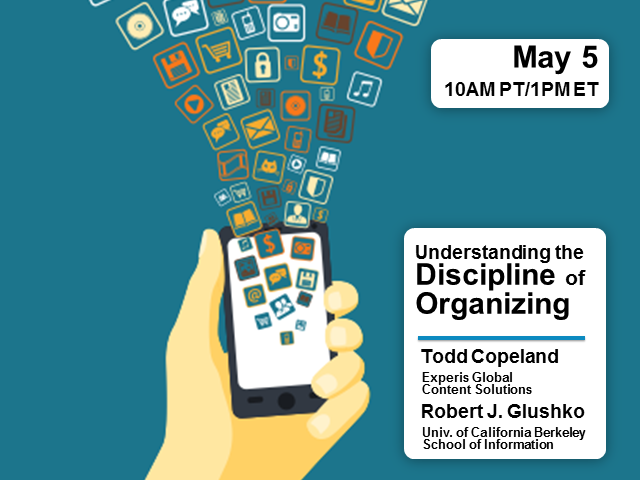 In this practical one-hour session with Todd Copeland, a senior director and content management expert at Experis, and U.C. Berkeley professor Robert Glushko, you’ll learn about the ideas behind organization and the skills and technologies to support more efficient work. You'll discover various types of organizing systems, what they have in common, how they differ, and why it's important, in the digital content economy, that we identify patterns of organizing and apply them to our own collections of things so we can create a discipline of organizing. A senior director with Experis Global Content Solutions, Todd Copeland consults with clients on content and digital asset management systems to streamline their business processes around communication. Todd is basically a polymath. He has been a research fellow in the Department of Physics at Georgia Tech and taught finance as a graduate instructor for James Madison University. He has written market analysis software and been a developer in the trenches. He holds a B.S. in chemistry and an M.B.A.
Robert J. Glushko has been an Adjunct Full Professor at the University of California, Berkeley in the School of Information since 2002. He spent a decade in Silicon Valley, where he founded or co-founded four companies in electronic publishing and e-business. He has a Ph.D in cognitive psychology from the University of California, San Diego and an MS in Software Engineering from the Wang Institute.